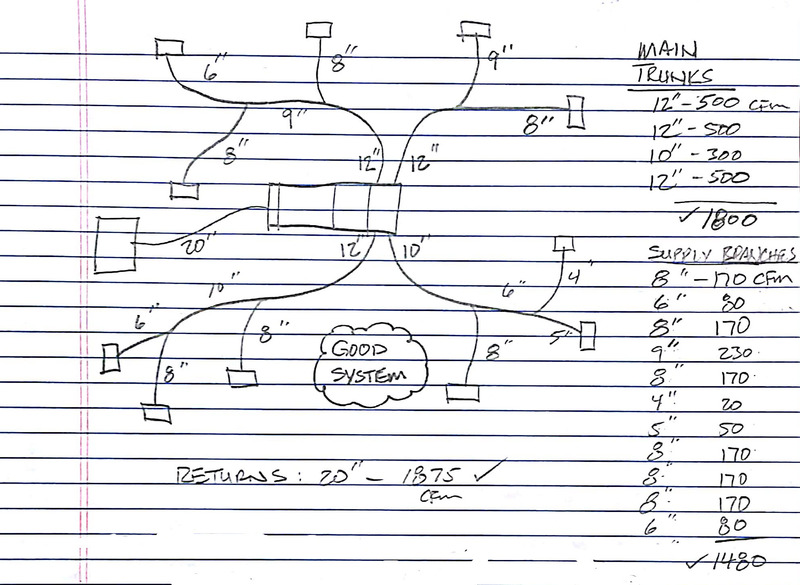 How to Quickly Evaluate a Residential HVAC Duct Layout | Russell King, M.E. Sorry for lack of posts	New 3D HVAC Design Software – Finally!! In about 10 minutes I can tell you if there are any serious problems related to duct sizing. Here is how I do it. 1. Figure out how much air is the system is supposed to handle. I usually use 400 cfm per ton (condenser tonnage) as a minimum. If the designer tells you a higher number, use that. 2. Are there enough supply trunks to handle this much air? List the diameters of all the start collars coming off of the supply plenum. Use the airflow table, right. This table represents how much air a certain size duct should handle in a “reasonably well-designed” system (friction rate = 0.10 iwc/100ft). Add up all of the flows – they should be greater than the target flow (from #1). 3. Are there enough supply branch runouts to handle this much air? Repeat step 2 for the supply branches (ducts that serve a single supply register). 4. Are there enough return ducts to handle this much air? Repeat step 2 for the return ducts. This test will not tell you if the equipment is over or undersized, nor will it tell you how well the system is balanced – whether the air is going to rooms in the right amounts, relative to other rooms, but it will quickly identify one of the most common problems: undersized ducts that impact overall airflow to the system. 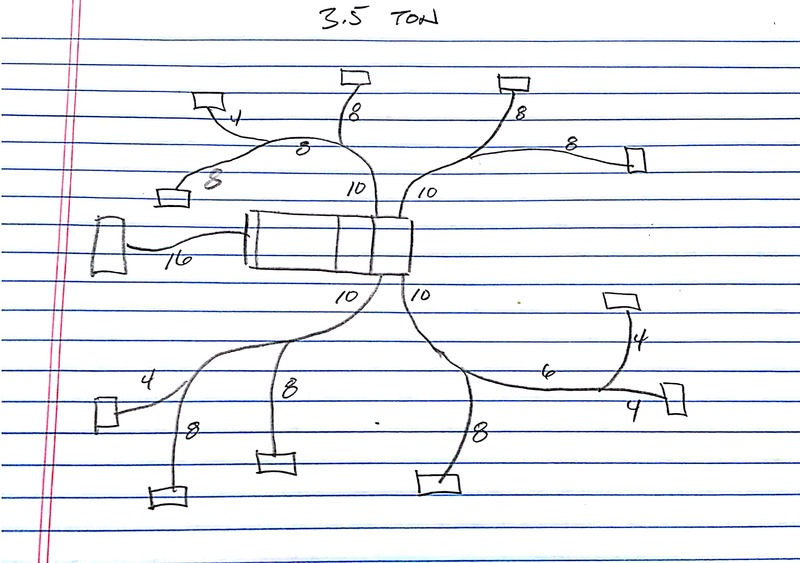 Let’s do it for this sketch: The target airflow would be 3.5 x 400 =1400 cfm. The four main trunks add up to 1200 cfm – NOT GOOD. The supply branch runouts add up to 1270 cfm – NOT GOOD. 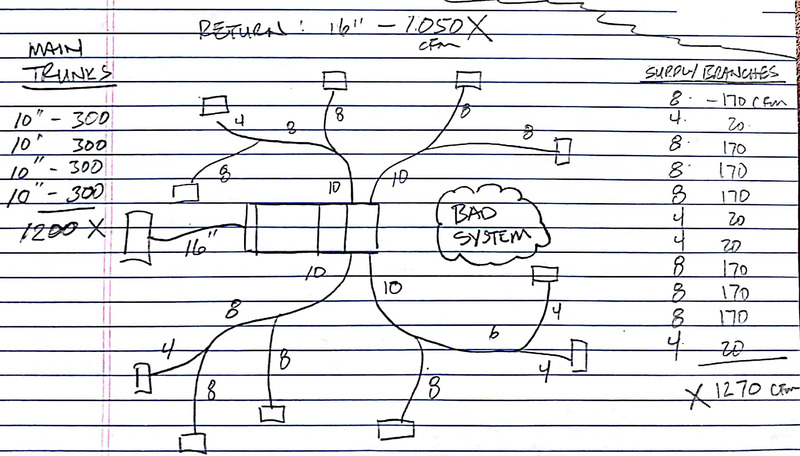 I frequently see 16″ returns on 3.5 and even 4 ton systems. A 16″ duct should only handle about 1050 cfm – VERY BAD. This system would run at a much higher static pressure and probably would not pass the minimum air flow and maximum fan watt draw test of CA’s Title 24 energy code (350 cfm/ton and 0.58 watts/cfm) and those are not meant to be hard numbers to beat, but far too few installers know how to properly size ducts. Some even take the time to use Wrightsoft or Elite Manual J/S/D software but then have some hidden setting in them that messes everything up. (See my article about why we need a simpler Design Methodology). Most installers just use old rules of thumb that result in these substandard systems. Kudos to those who actually do a good job. Their numbers are growing, but far too slowly. If they had used a better design methodology they might have come up with this revised version of the same plan. The revised layout passes this quick test. The four main trunks add up to 1800 cfm, which is good. The supply branch runouts add up to 1480 cfm, which is close, but OK. The return is a 20″, which can handle 1875 cfm, which is very good. Note that an 18″ duct would barely work. The intermediate “trunks” can be checked independently in a similar manner. This layout will probably work just fine, at least in terms of delivering 1400 cfm. Something that I have found to be true in many cases is that very good overall airflow will forgive a lot of sins, including minor balance issues and even minor over or under-sizing of equipment. It’s not that hard to do, folks! Russ, I really like your simplified approach. 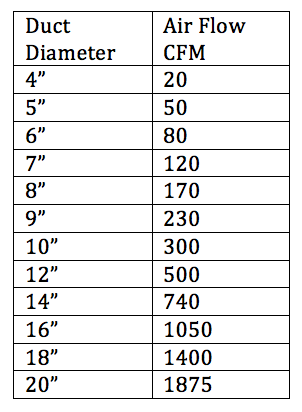 I believe every installer or designer should keep a copy of your duct sizing table in his/her wallet. Regarding the returns, I am in the school of reducing the velocity to the 400 fpm range. This would require 2 returns instead of 1. I use Table 150.0-C in the CA Energy Code/Standards as a quick guide and it seems to work well. A 3.5 ton system would use two 16″ returns to slow the air down and reduce the noise. The grille area in this case is min. 1000 sq. in. Thanks, Roy. Bigger is definitely better for returns. My approach is to determine if it meets the minimum requirements of an “acceptable” system. Guidelines such as the one you suggest are to help you design a “very good” system, so more power to you! A/C tech tells me that I donthave enough return. Can I branch an additional return to my system? My current return is 18″x20″ for a 4ton system. Yes, definitely. Assuming you have the room to attach more ducts, more return airflow is always better. You can either increase the size of the existing return duct and grille or add more. In you updated calculations; you added 12″ (500cfm) supply that is branched to 9″ (230 cfm) and 8″ (170cfm). That is total 400cfm. So if 500cfm is coming out and you have only 400cfm that can go through; how the system would behave? Please elaborate. Thank you. Great question. The way to think of those numbers is not as how much air is coming out, but how much air can they handle. When you do a full ACCA Manual J/S/D design you have airflow targets for each room. You size a duct to each room that has the ability to handle at least as much as you need. When a trunk serves two branches you size the trunk so that it can handle at least as much as the total of the two branches. So, putting the 12″ on there ensures that there is at least 500 for the branches (they need 400). Had I only put a 10″ on there, it would only handle 300 and the branches would be under served. The 10″ would have been a bottleneck. You should always pick the next larger size, just above your target. It’s interesting when you look at the duct size vs. airflow table how big of a difference there is between a size and the next size up. Going from a 6″ to a 7″, for example, is a 50% increase in airflow capacity. That tells you two things: 1. rounding up one size is very safe. 2. undersizing by just one size can be very bad. When you do it correctly, what ends up happening when you turn the system on is that it will end up delivering a bit more air overall than you designed for, and that is always a good thing. Some rooms may be a little more than you need and some may be a lot more than you need, but it is much easier to damper the airflow down than to try and increase it. Hi Russ. Thanks for posting this information. I just had a new system and duct work installed but I’m double checking the job. I feel like its missing an extra return. I live in Los Angeles in a 2200 sq ft split level with a 5 ton day and night system. I have 2 returns (12″ and 16″) so providing 1550. Output at box (12″, 9″ and 14″) so providing 1470. Out at registers at 1500. Based on the info given, I need about 450 more in return and more registers to balance everything out at 2000? Thanks for the help. I drew everything out if that helps. I can email it over to you.